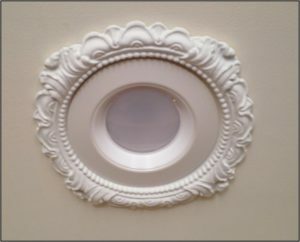 Victorian Style Recessed Light Decorative Trim fits LED Retrofit baffle trims and Wafer Thins up to 7-1/2″ in diameter, such as Commercial Electric T60 trims with white, nickel and bronze finish options. Made to fit LED retrofits up to 7-1/2″ inside diameter. Use with LED Retrofit trims up to 7-1/2″ in diameter. View, Print or Download Technical Specs for LR-601 here.